Standing 19 cms high, 19.5 cms wide and 11 cms deep, this project will take a while to complete, but will be a satisfying accomplishment. 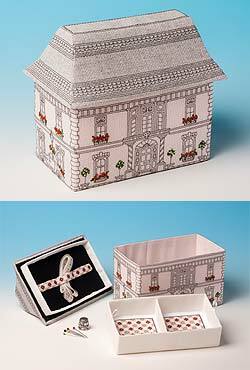 Matching sewing accessories, with the Victorian tile pattern, are also available. Kit contains: 14-count Aida, lining fabric, felt, plastic canvas, stranded cotton, ribbon, chart and full instructions.